There are a few topics worth blogging about more than once, and whale watching is certainly one of them. It’s time again to think about making a trip to the Oregon Coast, to witness the annual winter migration of these incredible animals . The quiet winter months bring with them miles of secluded beaches to enjoy, nearly empty streets, shops and restaurants to browse, and the unpredictable, stormy and awe-inspiring weather that often comes our way. These winter months also happen to offer some of the best whale watching in the Northwest. 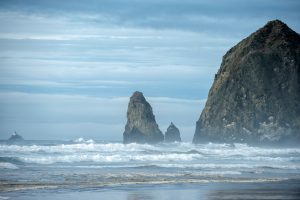 Book your room at the Arch Cape Inn & Retreat, and experience the magical quiet of Cannon Beach in the winter. Though whale watching is possible year-round on the Oregon Coast, there’s something magical about the Gray While migration during the spring and winter months. The Gray Whale migration begins in November and continues throughout the winter months, but the peak time to see them is now, in late December through mid-January. It’s hard to know exactly how many whales travel through these waters as they seek out their warmer souther nursery grounds, but it’s estimated that somewhere in the vicinity of 18,000 of these majestic animals migrate each year. Actually, it is considered to be the longest migration of any mammal on Earth, and you could see it from right here in Oregon. Though whale watching can take place virtually anywhere there’s a great view of the coastline, there are a few favorite spots from which to spot these gentle giants. Our favorite is Ecola State Park. Here, you’ll find volunteers working with the Whale Watching Spoken Here program helping visitors look for those tell-tale whale spouts and tail slaps. Heading out early is often the best time ti see them. You can also take a whale watching boat or helicopter tour for an up-close view of the migration, weather depending. Once you’ve spotted enough tail flaps and spouts, return home to a reception of afternoon wine, cider and small bites in the cozy ambiance of our welcoming Inn. Our stunning property is like no other on the Oregon Coast. Book your stay at our luxurious boutique hotel today, so you can experience this incredible aspect of nature with us this winter.